There are multiple additional features to choose from to enhance and customize your folder. Click below to find out more about each feature. Aqueous coating is available in gloss, matte, or satin. Aqueous coating seals in for faster drying process and may be required on folders requiring shipment in less than five days from order date. Gloss aqueous coating is included on all heavy coverage and four-color process presentation folders. If your customer prefers a matte or satin aqueous this may be requested on your order form. Laminate one side is an add-on price. It includes gloss lamination of 1.2 mil to the front cover, back cover, and inside pockets. Film lamination adds maximum durability to any folder, while its high gloss greatly enhances the folder’s appearance. UV coating is an add-on price. It must be added to one of the base prices. This price is for coating the front cover, back cover and inside pockets. Coating can be applied only on enamel or clay coated papers. This liquid gloss coating adds little to the durability of the folders; however, it does protect the color and adds considerably to the folder’s appearance. UV coating will show fingerprints on large areas of dark ink. However, a light wiping can easily remove the prints. Spot varnish, soft feel aqueous, matte lamination, and strike through aqueous are part of our in-house production capabilities. Our sales team will be happy to quote your special project. Four styles of business card slits are available at no additional cost. These may be centered on one or both pockets at no additional charge. H-1 is for horizontal cards. V-2 is for vertical cards. E-1 is for horizontal or vertical cards. Only the E-1 slit is available on 4″ x9″ and 6″ x 9″ folders. Please indicate which style you prefer as well as which pocket should be used. If you do not indicate a style, your folders will not have business card slits. 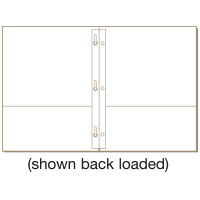 Business card slits are included in the price of your folder if you use the H-1, V-2, or E-1 as shown above. We also show four additional slits (below) which are available for an additional cost per order. You may specify position on pockets as right, left, or center. Use of these items may be restricted by folder construction or pocket dimensions. Use of more than one style per order incurs an additional fee. Custom business card slits are available to be made to your specifications. Please contact our customer service representatives for pricing. *There will be an additional charge for having two sets of card slits (from either group) on the same pocket. This option is not available on all folder styles. The base price for foil stamping of all folder products includes a total of 36 sq in. 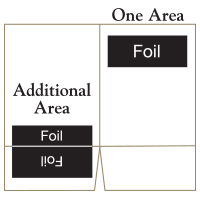 for up to two areas of foil. Both areas must be on the same sheet side and in the same foil color. See diagram below for how to measure these areas. 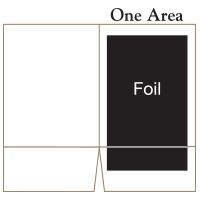 If you have two foil areas, add the square inches of each area together for your total. If the total is more than 36 sq. in. you require additional foil areas or colors. To determine the size of your foil stamp area, you must first draw a box around your entire image with the lines touching the outermost edges. The edges of the box you have drawn must run parallel to the edges of the folder. Measure the two perpendicular sides of the box, round each measurement up to the nearest inch, and then multiple the sides times each other. 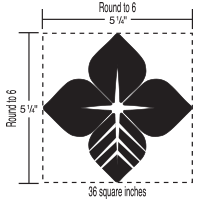 This gives you the square inch area for your die (see examples below). Spine prong attachments are available in white and are stitched into the center score of the presentation folder or report cover. They are made to hold only 8.5″ x 11″ 3-hole-puched sheets. Emboss is a base price shown on each item and includes a single level blind (no ink) embossed area up to 24 sq. in. Embossed folders include any base group paper and placement anywhere on the front cover, back cover or inside pockets. If the total is more than 24 sq. 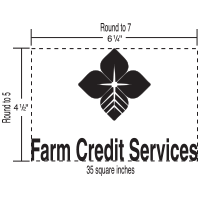 in., more than one area, or a variable other than single level emboss pricing will vary. Optional round Velcro® closures are available for an additional cost per portfolio. Velcro® closures add three days to your production time. Stitched inserts are available into the F1-1 or F1-18 folders. Available in 4, 8, 12 and 16 pages. Inserts are available with a folder order only (not sold separately).